We want to thank all of you who took the time to write us and show your support. We posted some of the many comments below. Enjoy! They struck your prayer from the record, restarted the session and had the House chaplain give a different nondenominational (and extremely wishy-washy) prayer? All because you mentioned Jesus and stated a cold, hard fact about Obama? Unbelievable. I think the Minnesota House just disowned Jesus. I loved your prayer at the state capital, it was great it’s so good to see a man of God stand up and say the truth, and all the congressmen that trashed your prayer should be removed from office, Praise God! Thank you and God bless you, Bradley Dean, for taking a stand for our Constitution, all the Americans who died defending it and for our Lord and Savior Jesus. I listened to your prayer and it was excellent and as patriotic as any one of our Funding Fathers would have prayed when the US of America was founded. The article on the front page of the Star/Tribune (aka “red star”) was a complete pack of lies and distortions and evil spewed out between the lines (truly disgusting bias and attempted smearing of you). It is a fact you never wanted homosexuals executed, that is a complete lie and fabrication. When the speaker of the house showed his true colors taking a stand against the Constitution and our war dead as well as Jesus Christ, he showed himself to be truly biased and unqualified to serve in state government or any government at all. His attack on you was truly disgusting just like the red star. This country is on its last breath and only a miracle from the Lord can save it. The diversity, political correctness and perversion recruitment programs in the school systems have just about destroyed any Godly morality left. And I am fed up with all the dual citizens who serve another state as their first loyalty not the USA. This should be illegal. These folks should have to make a choice and sign a loyalty oath and not ever be allowed to be in any government post. Anyhow, you did the right thing and I am not ashamed of anything you prayed or said. I for one am proud to have you in Minnesota working hard for all of us. You did a great job representing our Republic and God our Father. I can&#039;t thank you enough for all the good you do. "Sweet!!!!!!!! I love it thanks for the awesome message!!" Thank you for standing strong in a place many would back down from. Jesus is a dividing line for many, there is so much power and authority in His name. Continue to walk in His way. Thanks for speaking the truth Minister Dean!!! Thank you! Bradlee Dean and Brothers and Sisters in Christ for this website. I am very thankful for the courageous stand that Bradlee Dean took as he prayed publically from his heart the other day and incurred the anger of many of those politicians that were present. I am glad you shook up things by praying earnestly in the Name of Jesus. Never worry if your words were appropriate because they were. God filled your mouth with what to say and the prayer was powerful. Our country is blind to it’s sin and needs to be jolted awake to the only way to be saved and that is Jesus, whom you proclaimed. You weren’t ashamed of Jesus and He is not ashamed of you! I know that God is pleased Bradlee. Our nation must repent! I am praying for all of you to stand strong and firm in the liberty of Christ Jesus. I love the Lord and I love my country and I know that your prayer will serve to encourage and mobilize some believers to take a strong stand and to step up and speak the truth of God’s Word in and out of season. The Church has been silent too often, when it should be bold. Thank you for impacting this godless culture. One day I hope you will find out the true value of your prayer that day, Bradlee. I believe in my heart that: Somebody was listening with an open mind. Somebody was affected in a good way, even if they didn’t speak up. Somebody went home to look at their bible. Somebody examined their own heart to see if they were in the faith or not. God Bless you! May God continue to lead, guide and direct, and protect you as you fulfill His will and your purpose, on earth as ordained in heaven. Speaker Zellers got punked by the political left on Friday. Obviously he cannot think for himself and reacted in way that threw gasoline on a fire that did not even have a spark. I see no controversy in the speech and prayer and I am very confused over the whole thing. Speaker Zellers owes you an apology. He had a rhinoceros tone. I am calling my rep Tara Mack about this. I am also calling Salem Communications because I noticed they did not have the Sons of Liberty show on today. There is a beautiful thing called “Freedom of Religion” in this country. When we start dictating to Pastors what they are supposed to preach and what they are not allowed to preach. We are all in trouble. Hang in there, Pastor Dean. I will be giving my two cents on this issue. Thanks. 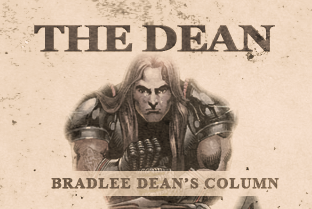 Hurray for Bradlee Dean! Speaking the truth in love. This was an absolutely beautiful prayer. God bless you Bradlee! This is what I wrote... I'm sending it along because the comments are exploding and it is hard to find. The MN legislature should just be glad you guys didn't send Jake over; they'd still be praying right now!!!! Keep it up. -ChrisÃ¢â‚¬Â¨ Ã¢â‚¬Â¨Fox has shown it's bias by stating in the title "Anti-Gay" pastor. The controversy is, as should have been reported and titled; "Pastor dares to act on conviction & beliefs and prays in the name of Jesus Christ; as our founding fathers did in years past". The founding documents of our country clearly demonstrate that this government was established as a Christian government/country based not on humanistic natural law, but upon the natural laws created by Jesus Christ, for by whom all things were created and all things are sustained. Jesus Christ is one of the three "who's" in the one "what" Christians describe as the Triune God, Father, Son, & Holy Spirit. All equal, but with distinguishable roles. Dean was right to pray in the name of Jesus Christ; as our first president rightly declared that the two pillars of a just society are religion & morality; but Washington wasn't referencing any religion or any moral code - no, to understand him the context of history, the only right interpretation of Washington is to understand that he meant the Christian religion, whose Author, Perfector, and only rightful leader is Jesus Christ. These facts, not about Christianity, but about the government's recognition there of Christianity are true -- and there's the rub. Fox missed the chance to highlight the real problem in both our Federal & State institutions -- the lack of a correct understanding of history -- now there's a real story.Ã¢â‚¬Â¨Ã¢â‚¬Â¨Kudo's to Dean; for he knows that truth is truth whether it is accepted, acknowledged, or not. From my point of view, Dean & his association Sons of Liberty Radio and./or You can Run but Cannot Hide International are only one of few Christian based organizations that love our politicians and/or the Homosexual/LGBT communities enough to tell them what his religion believes, what God has established because he cares for the soul. Ã¢â‚¬Â¨Ã¢â‚¬Â¨The "Anti-Gay" label in the subtitle couldn't be any more wrongly placed nor factually inaccurate. Dean says what he thinks & believes not out of self promotion nor attention seeking, but because he believes & wants others to think, debate, discern, and decide based on the truth, not based on the lies of a wayward culture that has distorted the thinking of the latest generations. I do not see anything wrong with this, this prayer actually made me happy to hear but the politicians involved didn't like it why? Whatever happened to In God We Trust- and nobody goes to the Father except through me-Jesus- Our nation is in dire need of an awakening by the Holy Spirit-Lord have mercy on us. "Another non-issue made into an issue by the ever-vigilant, non-partisan media." Those who have the courage to speak will be blessed by God with opportunity to do so. But how was this the slightest bit controversial? You fight the good fight. You are iron sharpening iron. You speak the Word, and humbly take on the sin that surrounds us. For this they call you radical. An on fire man of God in a culture of Godless, cold and lukewarm Christians...maybe you are radical. Some Ministries are like lightning rods separating themself from the worldly and ungodly by standing on Gods Word. Other ministries are like a weather vane on a roof that change direction when the winds public opinion blow. People which one are you? I'm outraged!!! That our leaders or lack there don't want to pray in the name of Jesus every time! Thanks Bradlee! I loved the prayer and if the speaker of the house in the state of MN Kurt Zellers can't stand behind this he does not stand behind America! He needs to be VOTED OUT. Thank you for doing this it exposed who the spineless in MN are! Love it when people tell the truth. Especially this guy! Heard absolutely nothing he said that I disagree with. I see nothing here to apologize for. Is there something wrong with speaking the truth? Leidiger is the one who should apologize to his constituents and to preacher Bradlee Dean. Thank you Mr. Dean. Truth needs no apology. Amen! I stand with you, Pastor Dean. Why was an apology necessary? He only pointed out the truth. President Obama is an enemy of Christianity and Judaism, and that took tremendous courage. Preach it, brother! Absolutely nothing wrong HERE!!!! God Bless You, Preacher!! Liberals can be offended, but Christians are not allowed. Trust Me, The majority of my Liberal friends offend me deeply!! Thank God they are few someone has to take a stand against these petty whiners, Americans are fed up !! Semper Fi.